Larson's Political Economy: Is Welfare A Workforce Subsidy? Normally I would refer to the original study, for obvious reasons. However, in this case the origin is a product by something called "Americans for Tax Fairness" and it is, frankly, not a very good report. It is so analytically weak and shallow that I do not want to honor it with another link. However, if anyone wants a copy for reference, I will be happy to share it. Everyone must pay their fair share. We need to reform our tax code, so it raises adequate revenues to meet critical needs in a fiscally responsible manner. This requires that wealthy Americans – the richest 2 percent – and corporations pay their fair share of taxes. "...found that a single Walmart Supercenter cost taxpayers between $904,542 and $1.75 million per year, or between $3,015 and $5,815 on average for each of 300 workers." Americans for Tax Fairness then took the mid-point of that range ($4,415) and multiplied it by Walmart’s approximately 1.4 million workers to come up with an estimate of the overall taxpayers' bill for the Bentonville, Ark.-based big box giant's staffers. I could go into the methodological flaws of the study, but I will leave that for a later article. For now, let us accept their premise (yes, it is really just a premise; contrary to their claims they don't prove anything) and assume that taxpayers de facto subsidize Walmart through welfare programs for their employees. Who pays the taxes that fund the welfare programs that low-income workers are eligible for? Are those taxpayers the same low-income workers? No, they are not. Before the Trump tax reform, ten percent of the employed workforce in America paid 80 percent of all personal income taxes. Since personal income taxes account for 80 percent of federal tax revenue, this means that 15 million people, out of a population of 320 million, paid 64 percent of the taxes that fund our nation's welfare programs. After the Trump tax reform, the burden of funding the federal government has been even more concentrated. With the cut in corporate income taxes and the changes to the personal tax code, hat ten-percent top earning group now pays more than two thirds of all federal taxes. Before we tie this back to Walmart, let us stop for a moment and address the "fairness" issue brought up by the American for Tax Fairness group. Nowhere in their published material (at least as far as it is available online) do they ever define what they think is a fair distribution of the tax burden. Should the top ten percent pay 70 percent of all federal taxes? 80 percent? 100 percent? Should the top-two percent pay all taxes? Since the current concentration of the federal tax burden onto a few shoulders is not enough to be called fair, we have to assume that Americans for Tax Fairness wants to tilt the burden even further. 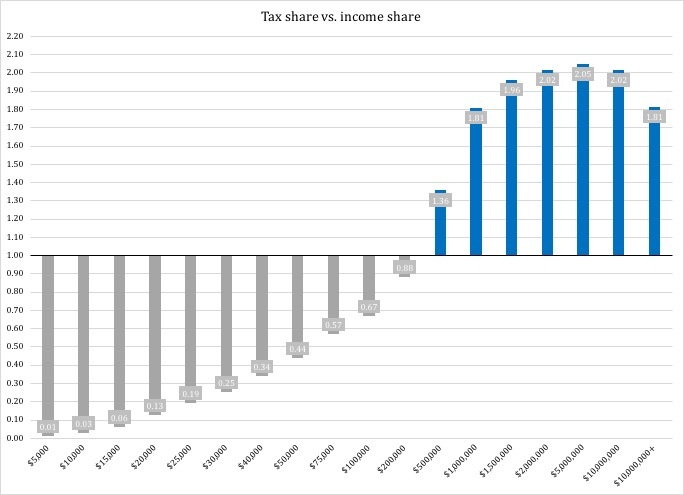 This, obviously, is not a matter of fairness; the only fair distribution of the tax burden is when everybody pays the same share of taxes as their share of taxable income. --If the ten percent who earn the least take home 5 percent of all income, they should reasonably also pay 5 percent of all taxes. It is nowhere near fair to push even more of the federal tax burden onto the higher income groups. That is not to say lower-income earners should pay higher taxes; all it means is that tax cuts - which we badly need - would go to those whose tax burden is already unfairly high. Those cuts would continue until we have a system that is at least within striking distance of fairness. Now that we have established who actually pays federal taxes - the taxes that fund the welfare state - the next question is: who are these million-dollar income earners? Guess what: they are the same people who own much of the big corporations, including Walmart. In other words, they already pay the bulk of the cost for the welfare that their employees qualify for under the welfare state. For the sake of clarity, it might be worth noting that those who try to make the "welfare is a workforce subsidy" argument are not making it easier for themselves by suggesting that corporations should pay higher taxes. A corporation is nothing more than the people who own and operate it. Every dime government takes from that business in the form of taxes, is a dime taken from those who own and work for that corporation. It is interesting to see how Walmart proved this point by passing this year's corporate tax cut onto its employees. In doing so, they also made the flip side of that point, namely that if you raise corporate income taxes, you take money directly out of the pockets of every person who gets a paycheck from Walmart. It is not the fault of our big corporations that some of their employees qualify for entitlements from the welfare state. The fault lies instead with the politicians who, over the decades since the start of the War on Poverty, have continuously and relentlessly expanded the welfare state. Without the welfare state the federal government could do without about three quarters of its tax revenue. That money would stay in the pockets of America's businesses and their employees. We could then use all that money to fund private charities for those in need; we would spend and invest a lot more in the private sector, which in turn would create a lot more well-paying jobs. It would be far easier for people who do not feel they earn enough, to make more and improve their lives. That, in turn, would reduce the need for private charity and help re-establish the notion of self determination as a staple of the American culture. *) The very wealthiest segment, earning above $10 million, is the exception. Their tax burden is still tilted but not to the same extreme as it is for lower million-dollar income groups. The reason is that this group lives predominantly on investments. At these levels work-based income is taxed higher than income from equity.